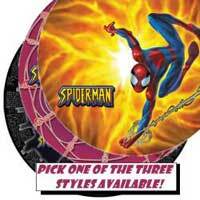 The amazing Spiderman HoverDisc flies like nothing else! Flip it, throw it, spin it -- the HoverDisc floats, hovers and defies gravity. Toss it, roll it, bounce it off a wall -- invent your own tricks and games! The HoverDisc inflates to an enormous 3 feet in diameter! Just fill it with air or helium and you’re ready to go! The HoverDisc is made with a high strength material that is designed to last! Not only is the HoverDisc durable, it’s refillable so you can enjoy it over and over again.